Many have wondered what is required, or what MUST be done in vocation discernment, or more broadly, in developing a strong prayer-life and relationship with God. The short answer is: pray. Pray as you feel Called by God. Various forms of prayer appeal to some but not to others, just as some a particular aesthetic may appeal to some, but not to others. If you pray, persist, and pay attention (which is quite a challenge for many) you will discover what form of Catholic prayer, what patterns, what times, what good works best reveal who you are in the Church, and your Call to love God. Here, you will find a small collection of spiritual resources selected from the vast Tradition of the Catholic Faith to aid your prayer life. This collection presents traditions which are profoundly a part of Catholic culture, such as praying the Rosary or meditating in Eucharistic Adoration, yet there are still others to be found which are more particular to religious orders, individual diocese, and even parishes, and may require a more guided practice at the start. Moreover, you will find here some element used in private spiritual practice, such as devotions to patron saints, and the practice of novenas, chaplets, and retreats. While the Benedictine Traditions welcomes all of the prayer traditions above, three practices remain central to monastic life. The Liturgy of the Hours, Lectio Divina, and Daily Mass. Each of these practices you will find in detail below. At Saint John's we gather for Morning Prayer (7:00 a.m.), Mid-Day Prayer (noon), and Evening Prayer (7:00 p.m.), as well as daily Eucharist (5:00 p.m.). The schedule is the same every weekday and is adjusted somewhat on weekends (see Vocation Guest's Schedule). As a vocation guest, when you pray with the monastic community, you will join the newer members of the community in the front of the monastic choir, with the senior members filling in the choir stalls behind you. One of the monks sitting near you will help you feel comfortable and become proficient using the prayer books. After the first day, you likely will be very comfortable navigating the Liturgy of the Hours at Saint John's. Learning to pray with the monks also includes learning the slow and deliberate pace followed in both spoken and chanted psalms at Saint John's. Prayer is nothing to rush through or to treat as a chore to get out of the way. The monastic tradition of slow pacing and periods of silence between psalms, readings, and hymns allows for reflection and patient listening to God. It may seem awkward, or even difficult to sit in quiet meditation. This challenge to patience and listening is only overcome with prayerful practice and persistence, but will quickly become intuitive and natural even to private prayer. Prayer is at the center of Benedictine life. Understood as “the work of God,” lectio divina and the liturgy of the hours are among the first works of monastic life. We come together each day to pray the Liturgy of the Hours and celebrate the Eucharist, but lectio divina, though usually a private practice, is also fundamental to the Benedictine life of prayer and is essential to living and growing in Benedictine identity and spirituality. As the common calling, prayer brings the differences and various pursuits of a community together to a unified role and identity as monks. Prayer is a comfort in times of distress, a resource when in need, a selfless sharing and outpouring in moments of success and joy. Prayer is so fully a part of the “ins and outs” monastic life, that it establishes the pattern and rhythm of the day through the dynamic interchange of worship and work. “Lectio divina” translates to “divine reading,” meaning a prayerful reading of Scripture, but also includes the writings of the Saints and Tradition. Though often referred to in the Latin, and so may, unfortunately, strike some as distant or foreign, the practice is really very common, even if the practitioner does not realize they are praying in the lectio divina style of prayer. Active and fundamental to the whole of the 2,000 years of Christian Tradition and inherited from the Jewish reverence for Scripture, lectio divina is an open, hopeful, and faithful trust and listening to God revealed in the Old and New Testaments, as well as the Spirit-filled writings and instructions of the Church. In short, every time you take a moment from your day to read from the Bible in faith, hope, and love, you are practicing lectio divina. A habitual, or even infrequent, resource to Scripture in lectio divina is a trustworthy spiritual practice, even without instruction. However, committing yourself to lectio divina can be challenging, and as a private spiritual practice, an exclusion of conversation and guidance within the Church community can lead to misunderstandings and isolation. As a 2,000 year-old Christian prayer, many words of advice and methods have developed and inherited throughout the Church Tradition for the purpose of helping establish this practice as a perpetual and reliable part of life and spirituality. One comprehensive introduction we favor and recommend is, Accepting the Embrace of God:The Ancient Art of Lectio Divina by Fr. Luke Dysinger, O.S.B., from Saint Andrew's Abbey in Valyermo, California. The Saint John’s monastic community celebrates daily Mass as an essential part of our spiritual practice. The Eucharist places Christ’s Passion, His Death, and the joy of His Resurrection before us as a central and stabilizing part of our lives. Gathered in His Name as a monastic community, both in celebration of the Mass and out, welcoming visitors and pilgrims to join us in the Sacred Meal, we trust in Christ's words, "[...] where two or three are gathered together in my name, there am I [...]" (Matt. 18:20). Although the Rule does not mention daily Mass, and indeed, early monastic communities and anchorites (hermits) may not have had the opportunity to attend daily Mass, today it is a standard part of nearly every religious house and community. Daily Mass at Saint John's Abbey is very similar to daily Mass in a parish community. Due to several factors, weekday Mass in both parishes and monastic communities is around 30 minutes. The Liturgy of the Word includes only one reading, the Psalms, and the Gospel, where Sunday Mass will include an additional reading before the proclamation of the Gospel. Additionally, the homily tends to be shorter than a Sunday homily, and music and singing are often shorter and simpler or even omitted. The monastic celebration of both Sunday and daily Mass at Saint John’s are open to the public but are particularly monastic in style so that you may notice a few differences from most diocesan parishes. One of the more notable differences is, the slower pace we followed through our prayers, readings, and long moments of reflection. Here at Saint John's, with permission from the Bishop and continuing the ancient Benedictine and early Church tradition, the monastic community and the visiting congregation stand during parts of the Liturgy of the Eucharist where parish communities will often kneel. Standing may strike a sour note with some people, but please be assured it is not a sign of disrespect for the Eucharist, the Church Magisterium, liturgical instruction, or the larger Catholic community. In the ancient Church, where the Benedictine tradition takes its roots, standing was the preferred sign of respect for the Eucharistic celebration. At the time, kneeling was often restricted on Sundays due to the Mass’ role as a celebration of the Resurrection—a time for joy—and kneeling is a sign of sorrow and repentance. 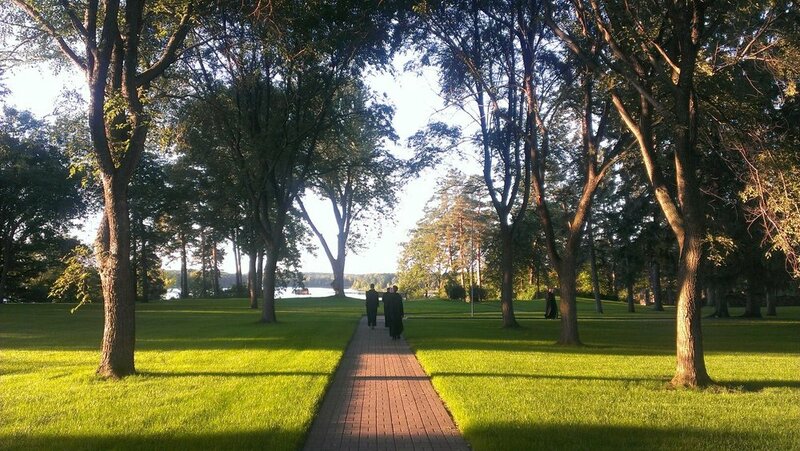 Although that discipline is no longer widely held in the Church, the tradition of standing has preserved over 1,500 years, and the Saint John's Benedictine community has retained that part of our Christian heritage. It should also be well understood that a Benedictine monk does not perceive standing as superior to kneeling, for one reason or another. This practice is not a matter of opinion or political statement; it is a matter of continued and living Benedictine tradition. So, if a Saint John's monk attends Mass at a parish church, for instance, he will kneel as everyone else will kneel. You will also notice the practice of concelebration during Saint John's daily Mass more frequently than you will at most parish Masses. This practice also reaches back to an ancient tradition of the Church and was encouraged by the Second Vatican Council. “Concelebration” is when multiple priests celebrate the same Mass. The concelebrants (the priests not leading the Mass) stand to the side in the monastic choir stalls, and with a barely audible voice, speak the words of consecration, and extend their hands with the presiding celebrant over the bread and wine. You will likely have seen this in your local parish, particularly when your Bishop visits and celebrates Mass with the parish priest. Finally, you will notice that Saint John's uses thicker, heartier Eucharistic Bread at daily Mass than you see in the parish. For most people accustomed to the Eucharist Bread in the form of a wafer, this can be somewhat surprising. We ask that when receiving the Eucharistic Bread, to remember that even the crumbs are the Body of Christ, and to be attentive to consuming the smallest pieces and letting nothing fall to the floor.